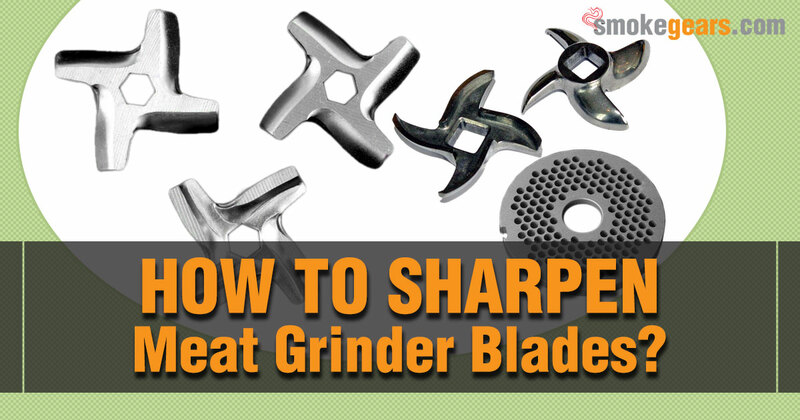 →How to Sharpen Meat Grinder Blades? How to Sharpen Meat Grinder Blades? I didn’t know how to sharpen meat grinder blades and that’s the reason why my kids didn’t talk to me for almost a day. I don’t blame them. They love shepherd’s pie and I disappointed them by serving a version with improperly ground beef. If you don’t want to be in a similar situation, read through the section below to learn the process of sharpening meat grinder blades. The good news is that the job can be done without any professional help. How to prepare for the process? Next, start preparing the sharpening device you would be using on the grinder blades. Place the glass sheet on a sturdy flat surface (the glass sheet you are using shouldn’t have any defect). Now, dampen a piece of cloth using water and wipe the surface well using the cloth. Make sure that the surface is only slightly damp; it shouldn’t be dripping wet. Finally, you will have to place the 120grit sandpaper (cut it to fit the glass sheet) on the glass sheet. This would allow the sandpaper to remain in place. How to disassemble the grinder? Use a suitable tool (the one you sue should be compatible to the grinder fastener you have) for removing the blades of the grinder. You must remember the order in which the blades were located. This will allow you to assemble the device flawlessly. Usually, the blades come with numbers. If your grinder blades are not numbered, place them on a sheet of paper and label each with a specific number. Before you start sharpening the blades, clean them well using a dry piece of cloth. How to sharpen the blades? Wear the safety gloves and press the blade you want to sharpen onto the sandpaper creating an angle of 45 degrees. Next, move the blade along the surface either in circular motion or by creating the figure eight. Repeat the action ten to twelve times. That’s enough for giving the edge of the blade a uniform sharpness. Replace the 120 grit sandpaper with the 600 grit version. Use the same procedure to secure it on the glass sheet. Move the sharpened blade along the sandpaper surface either in circular motion or by creating the figure eight. This time, you will have to repeat the action four times. This step is essential for giving the edge of the blade a perfectly clean finish. To find out whether the blade is sharpened well enough, use it to cut a piece of scrape paper. If you are happy with the results, you should complete the procedure by washing the blade carefully using clean water. I usually, wash all the blades together after finishing the sharpening job. If you want, you can wash them one by one. Ideally, you shouldn’t install the blades into the grinder when they are still wet. Wait for a few hours for them to get dry. Finally, place them back onto the grinder one by one. Make sure you are placing them in the right order. The above discussion must have helped you to understand how to sharpen meat grinder blades. Try the method by yourself and I am confident that you will find it easy. Think just for a moment, your meat grinder is damage and you need to grind meat urgently. What will you do at this situation? Don't worry check How to Grind Meat without a Grinder?